Located in the heart of Cambridge, Waikato, New Zealand. 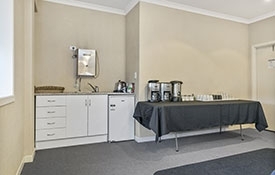 No1 Motels has a range of modern motel/hotel-style accommodation rooms and a conference venue that suits travellers, local sports event participants, holidaymakers, group wedding guests, conference participants, business people and families. No1 Motels provides its guests with 18 studio rooms with ensuites, 2 bedroom studio units and 8 rooms with shared bathroom facilities, sleeping in total up to 80 guests in one night! We are opposite the Cambridge Town Square and Cricket Club, 3 minutes to Cambridge Raceway, thoroughbred studs and new 'Home of Cycling' Avantidrome (Velodrome currently under construction, due to open at the end of the year) located at St Peters Boarding School. 15 minutes to Lake Karapiro, Mystery Creek Events Centre, Hobbiton, Hamilton International Airport and Hamilton City. 1.5hrs from Auckland, 1hr to Rotorua, Waitomo Caves, Tauranga and Mt Maunganui. Payment Policy: Credit card details to secure your booking. Full payment on arrival unless you have an account with us, or book and pay now online. Cancellation Policy: We will require 48 hours' notice, first nights' accommodation will be charged. Large bookings of more than 3 units will require 1 weeks' notice. We stopped just one night - so easy to get in and out of on our way back to Auckland airport. Large, clean room; I think you need to specify the room type you want, given some earlier TA reviews. The communal kitchen is great for making (free) breakfast and preparing snacks. Good off street parking and take-aways and supermarkets all within a 5 minute walk. Would stay again when next we have to get to or from the airport. Well worth stopping in Cambridge on the journey North. Beautiful town and architecture from art Dec era. Antique shops to peruse. Lake Karapiro to enjoy. And fabulous eateries. Accommodation is very central and convenient. Stairs only to the upper rooms so access might be challenging for some. Plenty of off road parking. Communal breakfast room for complimentary self serve breakfast is a bonus. Centrally located in Cambridge within walking distance to all restaurants etc. Room had all you would real ably expect, including kettle, good shower, comfy bed. Window not extra large, but sufficient. Great shared balcony and kitchen. Self service breakfast (tea, toast, butter, jam, cereals provided by motel). 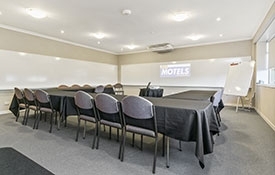 As well as 28 modern accommodation rooms that can be booked online using our real-time booking system, No1 Motels on Victoria can host your conference, staff training, seminars and meetings in our separate co-located conference room with kitchenette. Perfect for businesses requiring a quiet meeting room with staff and clients seating up to 35 people in total. No1 Motels is also perfect to accommodate large wedding groups under one roof – see the following highly recommended local Cambridge wedding venues. The Henley Hotel – If you love the great outdoors The Henley has many options for a garden ceremony. Fancy cherry blossoms falling as you walk down the aisle? Perhaps the camellia-lined oval lawn? Or, try their peaceful lakeside pavilion. Options abound. The Red Barn – A unique wedding venue in a stunning rural location only 20 minutes from Cambridge. The Red Barn was originally built around the turn of the century as a livery stable where stagecoaches could change horses for the journeys that today we take for granted. Over the years The Red Barn has lived through many changes, even out-living the grand old homestead situated in front of the barn. Cambridge Town Hall – Built in 1909, the Cambridge Town Hall is great for weddings (main hall seats up to 190/200 at tables), performances (seats up to 350) and exhibitions. Two side rooms are available for separate hire. Only 2 minutes' walk across the road from No1 Motels.